I was reading FuzzyLizzie's page about the history of sportswear and found the following info really interesting: "During the 1920s leisure increased, and so did the demand for more casual clothing. More and more people had the time and money to golf, play tennis and take vacations. Many department stores had opened "Sports Shops" by the mid 1920s, in which tennis and golf dresses, riding clothing and even knicker ensembles for women were offered. Increasingly, there was also "spectator" sportswear - casual clothing which was not for participating in a particular sport, but rather for watching. These clothes were most appropriate for country wear, but were often dressy enough for town. Some sportswear departments were even called "Town and Country" shops. By the 1930s, the term "sportswear" had come to mean wear for casual occasions, not just clothing for active sports. 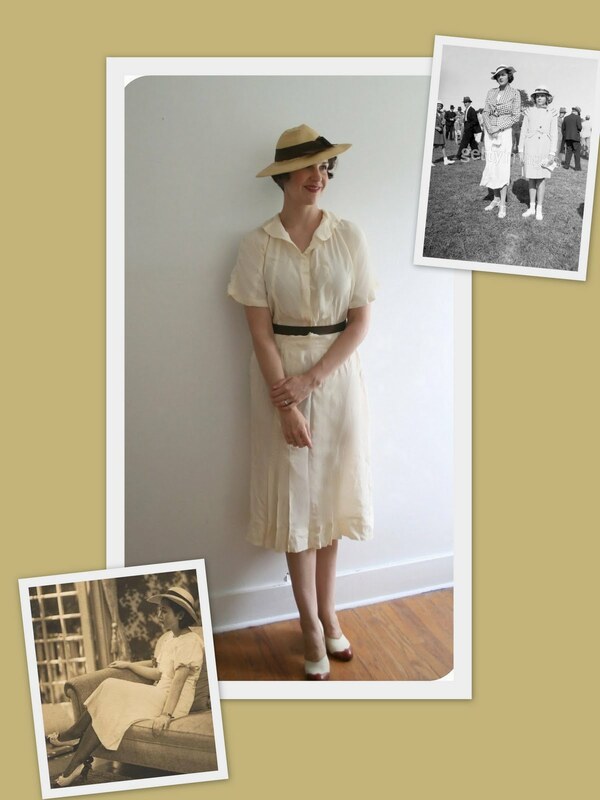 Not only do I love that 30s ladies wore some pretty fabulous sportswear to play tennis, golf, and so forth, but I adore the ensembles they wore to watch others play sports (spectator clothing). Here's a random rainy day effort to try out a mock spectator outfit with the aid of an otherwise rather blank frock that was buried in the recesses of my vintage storage and my "spectator" heels. Hat from Miss Matilda Dreams. This dress is just absolutely beautiful!! And I love your hat too! This outfit is amazing!! Love, love, love the hat--it looks fantastic with the outfit. Interesting about "leisure" clothes. How sophisticated were they, so that even if you weren't an athlete, you were still watchable, lol. How we take leisure for granted today, no? Anyway, LOVE everything about this post! HA! That hat, that girl, I'm in love!! Great informative little post, and that hat is stunning on you! You look so beautiful and stylish! I remember reading something similar about sportwear in the '20s and '30s in a book, and I love how they made sports and leisure seem so...chic. Isn't it amazing how much sportswear has changed? I like sports but I would probably be more interested if they wore clothes as lovely as the outfit you're wearing! A favorite subject! Sigh - I might even attend sports events if the spectators looked like that. It IS amazing how much the clothing worn by athletes and their fans has changed, I totally agree! Let's just say I wouldn't be wearing this to a baseball or football game anytime soon, not only because I don't watch baseball or football, but because the thought of nacho cheese splashing me is a mortal fear! I love that hat! I really must buy more hats. FANTASTIC! I love this outfit on you, brilliant! Hey, thanks! I have WAY too much fun playing rainy day dress up!